The Justice Palace. It’s the never-ending renovation project that stopped seeming absurd long ago and now just seems like a normal part of the Brussels skyline. If you have lived in Belgium for less than 32 years, then you have no idea how the Justice Palace looks without its ubiquitous scaffolding. And you certainly never expect to. But, according to federal interior minister Jan Jambon, if you can just hang on another decade, you will be richly rewarded. The exterior renovations to the 19th-century building will be finished by 2028, he announced last year. Works will begin in 2018, he said. 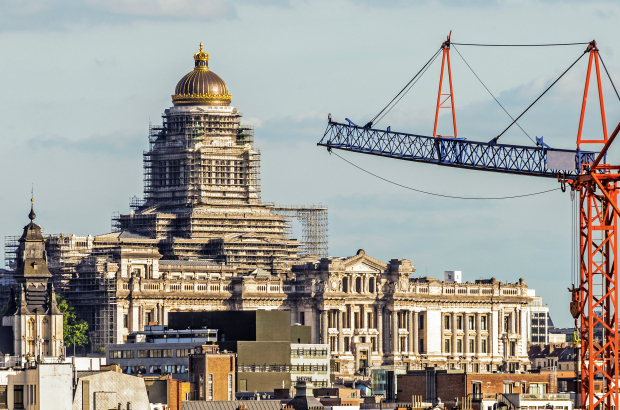 But – you see this coming – the chair of the Poelaert Foundation, which co-ordinates the services in the 26,000 square-metre building, said this week that that big plan is already behind schedule, and he estimates that the scaffolding will not disappear from view until 2032. Those of us still alive then will be able to witness the complete renovation of the building’s façade and its tremendous gilded cupola. Works to the interior of the building, though, will take longer – estimated to finish in about 2040, when your third great-grandchild becomes a judge. Buyle is trotted out in front of cameras every few years to comment on the progress of the renovations, some of which in fact have taken place. The flat portions of the roofs, for instance, have been replaced. The reasons for the snail’s pace on the rest of the building’s renovations are numerous. More than one ministry as well as heritage agencies are involved, and there is a lack of vision of what the renovations should entail and how they will be carried out. One of the most pressing issues, according to a 2016 Bruzz report, is whether currently empty spaces in the mammoth building should be used for other purposes, and if so, what. The scaffolding, meanwhile, was put up – illegally, as it turns out (no permit) – in the 1980s. It was at first rented by the city and then later bought outright. It made headlines a few years ago when it, too, was rusting and breaking down, with parts of it needing to be replaced. The scaffolding cannot simply be removed because it includes supports that are literally holding the walls together. And according to Belgian papers, the whole thing is supposed to be completed in 2040, so 8 years after the scaffolding is supposed to be removed. You couldn't make this stuff up.